The Air Force turntables are highly acclaimed for their innovative design ideas, unique construction and core “air” technologies, all developed to accomplish our goal of realizing ideal analog reproduction. To attain the ideal analog reproduction we tried to approach it in the same way a lacquer disc is produced. The process of manufacturing an LP record is critical to the sound. When the lathe carves a groove into a lacquer disc, the disc is held down onto the platter using a vacuum. This reduces wow and ﬂutter, any degradation of sound quality, and also increases the signal to noise ratio, thus avoiding anything that may have a negative effect when creating a very high quality master. Then the engineer lowers the pickup into the groove in the lacquer disc and listens to ensure the groove is properly cut. This lacquer will be the master to produce the vinyl records. To re-enact the same status in record playback, all the models of the Air Force series feature a vacuum LP hold-down. Our goal for the Air Force Series is to precisely extract and reproduce all information embedded in the groove, with nothing added or sacriﬁced. 1963 Obtained a degree in mechanical engineering. 1964 Joined Stax Ltd. as an engineer and engaged mainly in manufacturing engineering, development of electrostatic headphones, etc. 1973 Moved on from Stax and founded an OEM together with a few members from Stax. The OEM was set up to design and manufacture audio products. The representative products for this company were Micro Seiki’s electrostatic headphones, Infiniti’s Black Widow, Craft AC 300 Tone Arm, among others. 1980 Joined Micro Seiki Co. Ltd. Held a position of manager of the technical department and later as Sound Business Director. 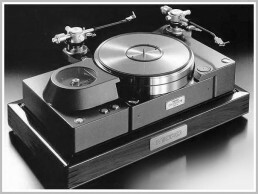 The statement product planned and designed from this period is the SX-8000 system turntable. Also developed a line of accompanying products. 1989 Founded Stellavox Japan Inc. together with Yasuo Nakanishi, who was the CEO of RF Enterprises Inc. Started the import & distribution business of high-end audio equipment with dedicated force. The company name was changed to Stella Inc. in June, 2012. 1994 Became CEO of Stellavox Japan Inc. (current Stella Inc.). 2001 Founded Zephyrn inc., which imports and distributes high-end audio equipment. 2010 Founded the house brand, TechDAS, which has been offering the Air Force analog turntables.